Summary HomePlug AV500 Adapter set with 10/100 port in compact form factor based on QCA AR7420 / AR1540 chipset. Our last Homeplug review of Linksys' PLE500 and ZyXEL's PLA5205 was our first look at Homeplug AV2-500 designs using Qualcomm Atheros' (QCA) QCA7450 / AR1540 HomePlug AV2 chipset. Whether the label on the box says "500 Mbps" or "600 Mbps", I generally have considered products using this SISO chipset equivalent to previous-generation Homeplug "AV 500" products. But based on the results of this review, I may have to reconsider that position. 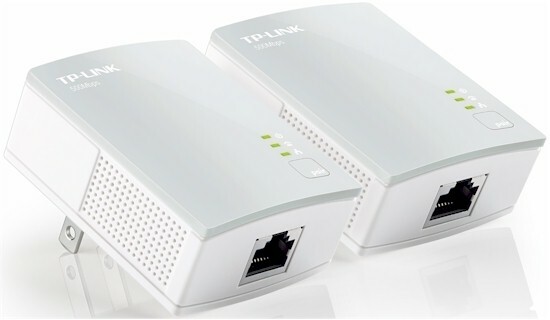 The two objects of our attention this time are two TP-LINK powerline adapter sets. The TL-PA4010KIT at around $40 is a top-seller on Amazon, most likely due to its low price. The TL-PA6010KIT is about twice as expensive, which seems a lot to pay for stepping up to a Gigabit port vs. the 10/100 on the TL-PA4010. But QCA7450 / AR1540 based adapters seem to all carry a higher price tag than the older AV500 type. The photo of the two adapters below shows they have the same footprint, but different thicknesses. If the PA6010 had to be bigger, TP-LINK chose the right dimension to grow it in. Outlet placement is near enough to the top edge on both so that neither will block the second socket in a standard duplex wall outlet. It is shocking how small these adapters are. Both really do have a footprint smaller than a credit card. The photo below shows both adapters have non-polarized two-prong plugs, making installation more flexible than for adapters with three prongs. The serial number labels show both adapters operate over a 100 - 240 VAC range. The indicators and buttons are the essentially the same for both products, with minor differences in physical placement. The Green / Amber / Red connection quality feature found on other current-generation adapters is not supported on either of these. That's ok by me; I haven't found it to be very helpful anyway. 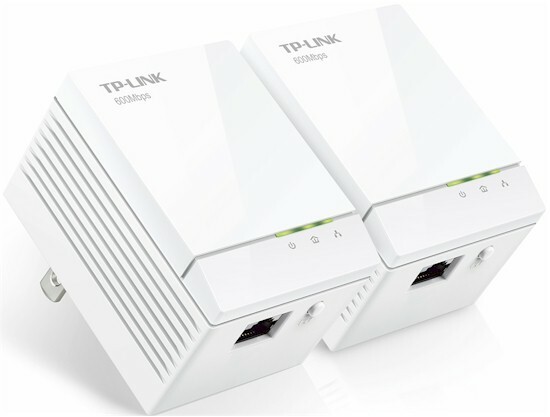 Note that TP-LINK also sells individual TL-PA4010 adapters, but the TL-PA6010 comes only in a kit of two. I tested both adapters at three locations in my home using this procedure. Pairs of the same make/model adapters were tested with separate up and downlink tests at each of three test locations. Simultaneous up/downlink and four-stream tests were also run at Location A. All results were entered into the Powerline Performance Charts. Since past experience has shown that powerline throughput varies with distance, I used the Performance vs. Location view to compare performance. I included only the two TP-LINK adapters for the comparison. We'll use the new Powerline Adapter Ranker later for wider comparison. The Downlink Throughput plot below shows the TL-PA6010KIT pair outpacing the TL-PA4010KIT by a significant margin in all three test locations. The 263 Mbps Location A throughput is the highest downlink throughput we have ever measured from any powerline adapter! Granted, this same-outlet test isn't likely to be encountered in actual use. But this test shows the high throughput the product is capable of and it is run for all adapters. Even the more realistic scenario Location C test yielded 140 Mbps. That's real, useful throughput, folks, not link rate. The uplink chart shows similar and even higher results than downlink. Location A throughput reaches a new Homeplug high of 267 Mbps! Note even the worst case Location E comes in just over 100 Mbps! The IxChariot plots for the TL-PA6010KIT are very informative. The composite plot below for downlink tests shows some rate adaptation occuring in the early part of each test. The big jump for the Location A test at around the 5 second mark is an IxChariot effect from Nagle's algorithm we see also when testing 802.11ac adapters. It indicates a product pumping data at a very high rate. I could see the rate adaption in action when noise sources (those damn little wall-warts!) were plugged in and out. I could plug in a wall-wart and watch throughput take an initial hit, then slowly climb back toward, but never reach, its previous level. Still, some throughput recovery is better than none! The TL-PA4010 pair composite downlink plot has the narrower spread among locations that is characteristic of AV500 products. The TL-PA6010's simultaneous up / downlink plot is also interesting for its remarkable symmetric throughput sharing between up and downlink. We normally see more lopsided throughput allocation, such as seen in the TL-PA4010 pair plot below. The new Powerline Adapter Ranker places the TL-PA6010KIT in the #1 position among AV2-500 class adapters, with the Linksys PLEK500 and ZyXEL PLA5205KIT pairs tied for #2 rank. Although all three products have average up downlink throughput > 100 Mbps, the TLPA6010KIT's performance had enough of a margin to make it a clear winner. The performance differences are not as great among AV500 class devices, even though they use a mix of QCA chipsets. So ranking is more of a numbers game, even though the Ranker now requires performance differences greater than 5% to trigger a difference in ranking. Still, the TL-PA4010KIT managed only a #5 rank out of 9 products tested and that's with two products tied for #2 and two tied for #3 ranks. Comparing the Ranker Performance details of one of the #2 ranked competitors, we see the reasons for the TL-PA4010KIT's lower rank. AV2-500 adapter prices have come down from the $120 asked for the first adapters about a year ago, to closer to $80 today. Still that's a 2X premium over many AV500 designs, some of which have Gigabit ports. But if you want both a Gigabit port and enough throughput to make good use of it, TP-LINK's TL-PA6010KIT seems a clear choice to me.